Grind kirlu(1/2 cup) with 10 red chillies ,tamarind(little) ,rice(1 cup) soaked before an hour without adding water(or just sprinkle water). 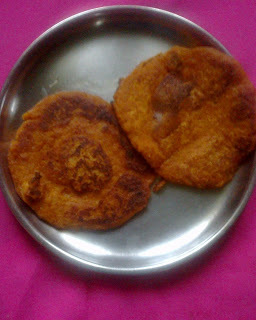 Heat a dosa pan, add little oil, now pour a laddle full of batter like dosa, put oil & cover. Turn to other side(roast both sides). Note: If you are using kirlu stored in salt water, then add salt after seeing taste.